After more than two days of testimony, a Grant County jury took less than two hours on Jan. 22 to find Brandon Barnhill guilty of the murder of 1-year-old Kiara Smith. The 25-year-old Crittenden man was sentenced to life in prison with the possibility of parole after 20 years. “I believe the evidence is overwhelming that he clearly beat a child to death,” Commonwealth Attorney Jim Crawford said in his closing arguments. “He still won’t stand up like a man for what he’s done,” he said. The Grant County News wants to hear about someone special in your life. It could be your sweetheart, your children, your parents, a neighbor or family friend. The News staff wants to know why they are special. If your letter is chosen, your special someone will be featured in the Feb. 18 issue of the Grant County News. Let’s get this party started! The Grant County Relay For Life will hold a kickoff party from 6:30 to 8:30 p.m. on Monday, Jan. 25 at the Grant County Extension Office on Baton Rouge Road in Williamstown. The relay is the signature fund raising event for the American Cancer Society. Money is used for programs and research. The kickoff event is open to business owners, team captains, cancer survivors or those just wanting more information about the relay. For more information on how to get involved, call 824-3343 or 1-800-ACS-2345. In its first year in existence, the Grant County 4-H Robotics team has excelled beyond expectation. On Dec. 5. the Grant Gear Grinders won second place honors competing against 23 teams at the First Lego League Robotics Regional Competition at Twenhofel Middle School in Independence, which qualified them to go on to the state competition at Western Kentucky University in Bowling Green on Jan. 9, where they ranked eighth place out of 42 teams. Missed school days have caused a shift in the calendars for Grant County and Williamstown school districts. Each district missed three days because of snow Jan. 5, Jan. 6 and Jan. 8, but the plans to deal with the make-up days are not the same. Students at Grant County Schools originally were scheduled to have their last day of classes Wednesday, May 19. The final day for students now will be Monday, May 24, unless more days are missed. However, Williamstown Independent Schools are not adding days to the end of their calendar. The trial of a Crittenden man accused of killing his girlfriend’s baby began yesterday (Jan. 20) in Grant Circuit Court. 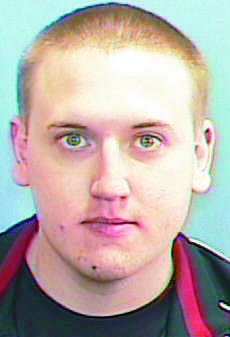 Douglas Barnhill, 24, was indicted Feb. 11, 2009, for the murder of 13-month-old Kiara Smith, who was left in his care while her mother was at a family funeral. Barnhill has remained lodged in the Grant County Detention Center since his arrest on Feb. 11. Before his arrest, he operated an indoor flea market on Main Street. For the second consecutive summer, Kentucky Changers will help beautify Grant County. An organization sponsored by the Kentucky Baptist Convention, Kentucky Changers uses seventh through 12th graders to refurbish exteriors of homes. For the first time in its 16 seasons, the project came to Grant County July 4-11, 2009 with support from the Crittenden Baptist Association. About 150 youth — 30 from Knoxville Baptist and Mount Carmel churches— worked at 30 sites in Grant County. B.J. Walters keeps a keen eye on her many children. 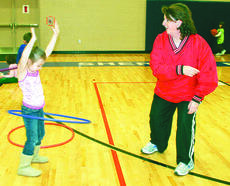 So many they could fill a gymnasium and do each day of the week at Sherman Elementary. “I’ll help you,” she says, bending over for at least the 12th time to tie the shoe of a first grade student. “I get that a lot,” she says with a smile. Her smile stays with her from the start of class to the end. She gets hugs in between and even when she’s doling out discipline she’s doing it with a lot of love. The Northern Kentucky Health Department got a helping hand from volunteers in their recent response to the H1N1 virus. The Northern Kentucky Medical Reserve Corps provided citizens of both medical and non-medical backgrounds with a way to respond to events such as the swine flu vaccination campaign as well as other public health emergencies. Williamstown High School junior Steven Faulkner was nearly speechless. 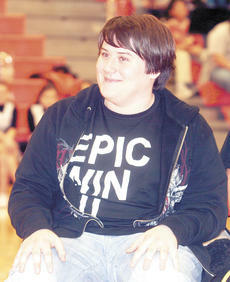 “I’m going to Disneyland,” he said to laughter and applause from a gymnasium full of fellow students. Faulkner was surprised Jan. 4 with an announcement that he was selected as the winner of the $500 “Promote Your School” scholarship contest sponsored by the Kentucky Higher Education Assistance Authority (KHEAA).